Last year, B&B bought a lovely red Honda CRV after their beloved Toyota Camry developed a crack in the cylinder block – whatever that is. Cadence, key and arpeggio I know. Cylinder block? Not a clue. Of course, I know it has something to do with a car, but cars are important to me only in that they deliver me to the vet for my twice yearly physical. So, you can imagine how much I absolutely adore the car. Anyway, B&B seem to require it, so they bought it. And for over a year it has been parked or been driven to the vet or to flea markets, art shows, trips to the country, shopping for cat food, etc., and all the time it has had a decorative license plate on the front advertising the place where it was purchased. Isn’t that kind of like wearing your t-shirt inside out? Not that I would ever wear a t-shirt, mind you, even though a few fans have expressed an interest in dressing me up. 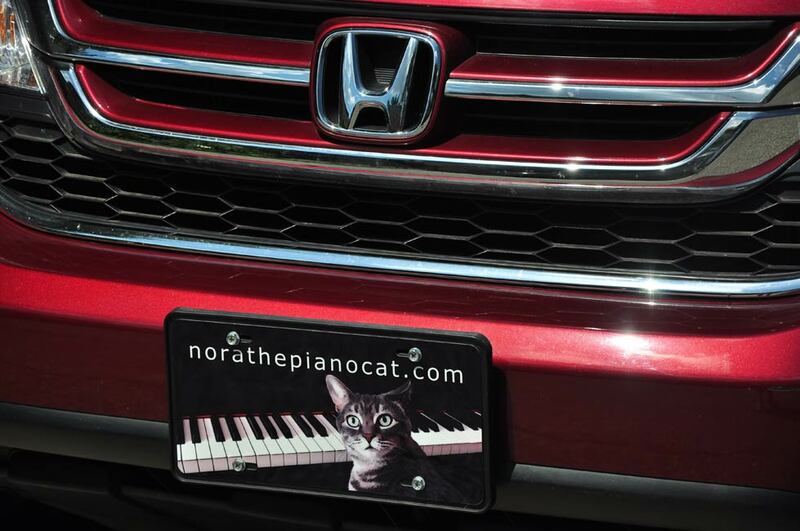 But before you start thinking that maybe you’d like a Nora The Piano Cat decorative plate on the front of your car, beware that some States require a regular license plate, front and back. And some cars don’t have a plate holder on the front. You definitely need a plate holder to screw the aluminum plate to. According to Cafepress, the following States require a regular State-issued license plate on both the front and the back of your car: WA, OR, ID, WY, MONT., ND, SD, MN, WI, NE, IA, IL, MO, CO, UT, NV, CA, TX, OH, VA, NY, NH, VT, ME, CT, NJ, RI, DC, HI, AK, MD. If you are lucky enough to live in one of the other States (not on the list above), and you have a plate holder on the front of your car, and you would like me keeping my eyes on the road ahead as you travel through this magnificent land, you can get your very own Nora The Piano Cat aluminum decorative plate on the Raven’s Wing Studio online shop. That is an awesome idea Nora! Boo hoo, my state won’t allow it. Ummm, I think you have WS for Wisconsin. It should be WI. Because I know they require 2 license plates here. And I was trying to figure out where Wisconsin was in that group. Other wise I would love to have Nora on my car. That is cool! Unfortunately, we live in one of the states that require two license plates. Which is sad because I would really have liked you to have to arrive at the vet’s before me! That is a lovely license plate though they require the boring ones in B.C. too. I think your owners showed great wisdom and sensitivity in choosing your lovely name. I have a very handsome boy cat named Bandy who looks very like you. Sadly, he does not play the piano, in fact he may never have seen one.